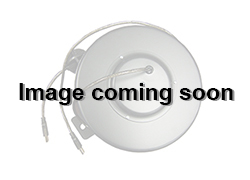 Our 5 pin DMX cable reels are commonly used for lighting control. Stage set up and breakdown needs to be quick and our reels help speed up the process. They can be locked at different lengths to minimize the amount of excess cable. The ratchet can also be removed to provide constant tension on the cable. DMX cable is available in our 9” cord reel enclosure and can be customized for special applications. Request more information to see how we can help you with a retractable data reel solution that suits your need or configure your custom reel today using our design worksheets.